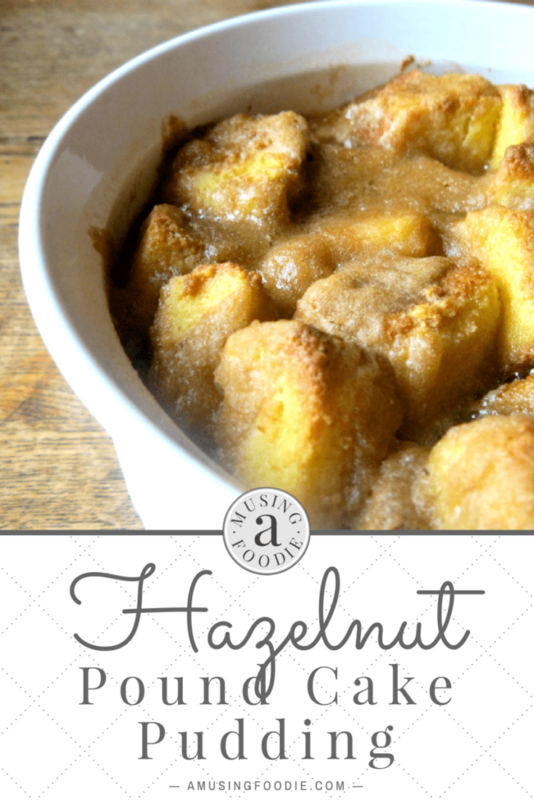 Think of this hazelnut pound cake pudding as traditional bread pudding with a modern sweet and velvety twist! One of my favorite things to do is take a classic recipe and make a few small tweaks to either expand the flavor or to simplify things. Bread pudding is a timeless dessert that’s perfect for using up stale, leftover baguette or Italian bread. The ingredients are minimal, and typically can be found as staples in your fridge or pantry: eggs, milk, vanilla, spices. 1. The bread pudding can turn out dry. 2. Waiting for the bread to become “stale” can take up to 24 hours. Well, I decided to toss the idea of “bread” out the window. Instead, I used pound cake for my bread pudding. It’s moist, and sweet and lacks the chewy texture of fresh, unstale bread. I also thought about traditional flavors. Vanilla and cinnamon are often used in bread puddings—yum! —but what if I used hazelnut coffee creamer as a flavor boost, too? Fabulous idea, my friends. Fabulous! Next the milk, eggs, vanilla and hazelnut coffee creamer are whisked together in a mixing bowl. The egg and milk mixture is poured over the pound cake, and then left to sit for 10 minutes in a medium mixing bowl. Softened butter and brown sugar are mixed together with a fork. After those 10 minutes are up, the pound cake is poured into a buttered baking dish. It’s baked at 350°F for about forty-five minutes, or until the edges are bubbly and the center is set. Goes great with a dollop of whipped cream, but make sure to let it sit for fifteen minutes before serving! Preheat the oven to 350°F. Grease a 1-quart baking dish with butter or non-stick spray, and then set it aside. In a medium mixing bowl, whisk together the granulated sugar, milk, hazelnut coffee creamer and vanilla. Add the pound cake cubes and let them soak for 10 minutes. Use a fork to combine the butter and brown sugar in a small bowl. Pour the soaked pound cake into the baking dish, and then top it with dollops of the brown sugar and butter mixture. 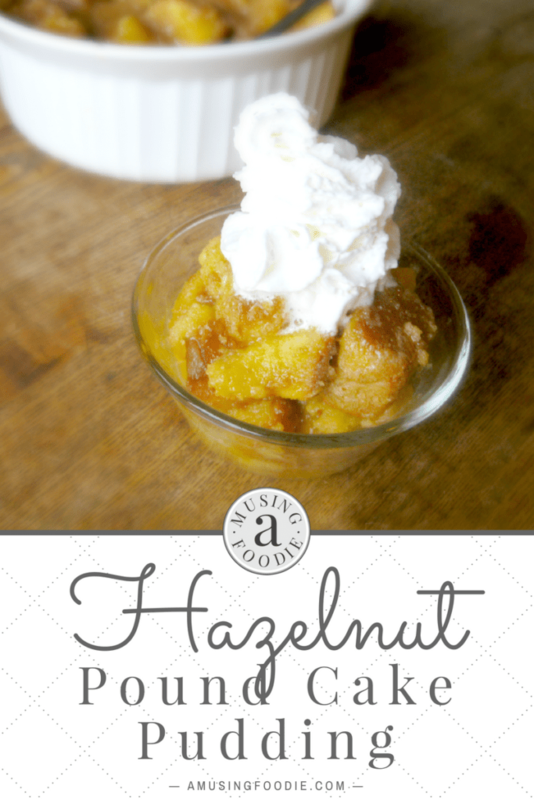 Bake for 45-50 minutes, or until the hazelnut pound cake pudding is bubbly around the edges and set in the center. Let it sit for 15 minutes before serving with a whipped cream garnish.